On September 6th, 2017, Florida’s Third District Court of Appeal released a decision in the case of Inspired Capital, LLC v. Conde Nast. The underlying dispute in the case centered on the applicability of a forum selection clause that was contained within a licensing agreement. Upon review, the court upheld the lower court’s ruling that the forum selection clause was applicable and must be applied. This decision is instructive to Florida business owners. Once again, a Florida court reaffirms that a voluntarily agreed upon forum selection clause will almost always be upheld. To help you better understand the concept of a forum selection clause, here our top-rated Miami business litigation attorneys explain the basics. First, parties to a contract can voluntarily agree that any related dispute will be heard in a specific jurisdiction. For example, if a company from New York state signs a business deal with a company from West Palm Beach, Florida, these two parties can agree that any contract dispute will be heard in New York state instead of in Florida. Though, to be clear, parties are restricted to jurisdictions where they are eligible to bring a claim. This means that companies cannot select any jurisdiction to hear their case. Instead, it simply means that they can pick which one of the otherwise valid jurisdictions will be used in the case of a dispute. This matters for several reasons, not the least of which is that certain jurisdictions are more favorable to certain types of legal claims. Beyond jurisdiction, the parties to a contract can also voluntarily agree to have their dispute resolved using a certain form of dispute resolution. For instance, two companies may sign an agreement that contains a mandatory arbitration provision. 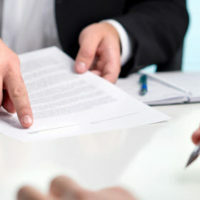 This means that arbitration will need to be used to handle disputes Alternatively, companies may choose to sign a deal that contains a mandatory mediation clause. As a general rule, Florida courts look to uphold these types of provisions. Finally, many business agreements contain a forum selection clause that specifies both where and how any contract-related disputes will be resolved. Indeed, a business may sign a deal that includes a forum selection clause that requires all disputes to be resolved by arbitration in Miami-Dade County, Florida, for example. At Pike & Lustig, LLP, our Florida contract litigation lawyers have extensive experience handling complex contract disputes. To learn more about what we can do for your business, please contact us today to request a free, no obligation review of your case. From our offices in Miami and West Palm Beach, we represent companies throughout southeastern Florida, including in Hialeah, Fort Lauderdale, Coral Springs and Homestead.